The Sainsbury Institute fellowship for Japanese Studies Young Scholars 2011–12 provided me with an excellent opportunity to conduct research at world-renowned museums and institutions, to collect material for my PhD dissertation and to work with scholars and curators in the UK and beyond. 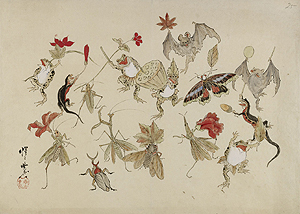 I was based in London for the whole year so that I could examine European collections of works by Kawanabe Kyōsai [1831-1889], a late 19th century Japanese painter. My main focus was the Israel Goldman collection, which is on long term loan to the British Museum. 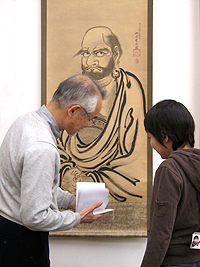 This is one of the finest and most comprehensive Kyōsai collections in the world and it is still growing. The Israel Goldman collection comprises almost 300 paintings, plus six painting albums which contain around 150 pieces in total, as well as numerous prints and printed books. Few of these works of art have ever been either studied or published. I photographed them all and created a digital catalogue based on the original inventory made by British Museum staff, a task which was only possible because I had regular access to the collection over the year of my Sainsbury Institute fellowship. The catalogue allows information to be filtered by keywords and sorted by various criteria so that researchers can take different approaches to the collection. The Excel catalogue file has links to photographic images of the works of art. 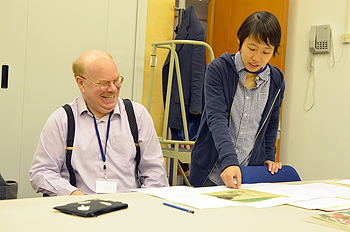 It is important to study paintings, prints and printed books first hand, so it made perfect sense for me to spend my fellowship year in Europe as many of Kyōsai’s works are now in European collections. During my stay in London I was able to study collections at the Victoria and Albert Museum as well as at the British Museum, and living in the UK made it easier to travel to other European countries such as Ireland, France, Spain and Germany. In total I carried out research at fourteen different museums and libraries in nine different cities. I presented some of the results of my research at two major London institutions affiliated with the Sainsbury Institute: the School of Oriental and African Studies (SOAS), part of the University of London, and the British Museum. At SOAS I had access to the library and attended seminars and lectures. This was an opportunity to get to know professors and PhD students and to establish a new academic network. I gave a talk to the East Asian Art and Archaeology Research Seminar and had very useful feedback from SOAS scholars. At the British Museum I held a study session with the shunga exhibition project team led by Professor Andrew Gerstle and Tim Clark. Back at the Sainsbury Institute in Norwich I met scholars from all over the world at the Third Thursday Lectures and other events. It was particularly profitable for me to share the office in London with another Sainsbury Institute fellow, Gyewon Kim (Robert and Lisa Sainsbury Fellow). We deal with different research subjects, but they share the same late 19th century historical background and often have interesting connections and common problems. As colleagues and friends we shared much of our London life and developed an invaluable relationship which will continue beyond the fellowship period. I participated in Gyewon Kim’s workshop at the Sainsbury Institute “Rumours and Secrets in Japanese Art and Visual Culture”, and this project is now rolling into another one with which I will also be involved. My year in the UK as a Sainsbury Institute fellow was indeed a fruitful one. It helped to develop both my research and my academic and social networks. It will be a firm foundation for future projects, including my PhD dissertation.